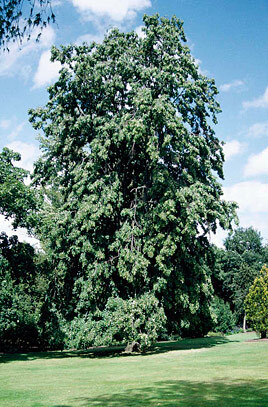 Tilia tomentosa Petiolaris is a large, elegant deciduous tree that won the Award of Garden Merit in 2002. It has large leaves which have a silvery-white underside, providing a contrast which move attractively in a breeze. The Weeping Silver Lime produces clusters of yellowish flowers that are richly scented and the classic autumn colour gives a vivid display of yellows that appear in early autumn. It tolerates most soils and will tolerate hard pruning. It grows into a significant specimen at maturity at over 20m and is therefore best suited to parkland and very large gardens.